Our travels today will take us to the city of Rishon Le-Zion, a modern city 30 minutes from Tel-Aviv and approximately 60 minutes from Jerusalem. It’s name “First to Zion” derives from the biblical verse in Isaiah, 41:27, and is appropriately so named as it was one of the first settlements in Israel. The history of Rishon Le-Zion is closely tied to the beginning of the Zionist enterprise in Palestine. In fact, the two most important symbols of nationality, the flag and national anthem, later formally adopted by the State of Israel, have their foundation in Rishon. A visit to Rishon Le-Zion’s open-air museum and a stroll down Pioneers’ Way toward the Carmel winery is a wonderful way to learn about the hardships and achievements of one of Israel’s first group of settlers. The municipality has done an excellent job of providing the visitor with a glimpse into the past by authentically renovating many of the founders’ homes, commercial enterprises and public buildings, making this visit an interesting educational experience for all family members. However, when additional funding becomes available, many more historical homes require renovation. The intersection of Achad Ha-Am and Rothschild St. is known as Founders’ Square, and the synagogue was one of the first buildings to be erected, together with those that now make up the museum complex. As Turkish law forbade the building of a synagogue, the founders declared that the structure was to be a warehouse. Using this rouse and perhaps gifts of persuasion, the warehouse later evolved into the synagogue as we view it today. In 1882 the area was quite barren, covered with brush, thorns and rocks as well as being devoid of water. Nevertheless, a group of seventeen enterprising families from Eastern Europe purchased 850 acres of land, in an effort to fulfill their dream of resettling the Land of Israel. These settlers were part of the initial wave of new immigrants to Palestine. Known as the First Aliyah, many brought with them personal experiences of the pogroms ravishing the Jewish communities of Eastern Europe. However, many also carried with them a fervent nationalistic feeling, having been exposed to early Zionist writers who espoused not only returning to the land of Zion but actually working the land through the establishment of agricultural settlements. Realizing that without water their dreams would be shattered, the settlers immediately sent one of the founders, Joseph Fineberg, to meet with Baron de Rothschild in France to appeal for financial assistance in the drilling of a well. Rothschild provided an anonymous loan, and the success of the new well is today immortalized in the seal of the municipality. The well, its pumping equipment and the adjacent water tower with its red shingled roof, ornate columns and sandstone foundation can be visited toward the end of the walking tour. After stopping to admire the synagogue, cross the street to the entrance of the museum (03-968-2435). These buildings previously housed the pharmacy, the public health clinic and the post office. Today the building houses a host of early photographs, maps and other historical items and is one of the most intersting museum attractions in Israel. Perhaps the most interesting display is that of the first flag of Israel, and the story behind it. To celebrate the third anniversary of the founding of the community, a banner was to be carried in a parade by a representative of Baron de Rothschild. Two members of the community chose the talit (prayer shawl) of one of the founders, Zeev Abramovitch, and sewed thereon a blue Star of David. They now had their banner. This very design of the Star of David, with two bars from a talit, was later adopted as the flag of Israel. Equally fascinating is the story of the first singing of the national anthem by the school children of Rishon Le-Zion.The poem Hatikva (The Hope) was written by Naftali Herz Imber during his stay in Rishon, and was edited by members of the community. However, it was a local farmer, Shmuel Cohen, who adapted its words to the tune of a Romanian folk song “Carl cu Boi”, a melody similar to Smetna’s “Moldau”. The words and tune grew in popularity and became a worldwide symbol for the Jews’ yearning to return to Zion, even many years before its formal adoption as the national anthem of the State of Israel. On the other side of the courtyard you can descend into the cellar of the pharmacy to view a reproduction of the first hebrew school in Israel, where Hebrew was taught not as a language of religion, but rather as a tool for everyday life. In the rooms above, you can view excellent recreations of village artisans at work, and nearby a display of fashions of the time. As you exit the buildings into the farmyard and stable of the Shalit family, note the reproduction of the American type of covered wagon, which was used in the late 1800s as a stagecoach to shuttle residents of Rishon back and forth to Jaffa. The inside of the Shalit house has been beautifully restored by the descendants of the original family and outfitted in period furniture. As you depart the museum complex on Achad Ha-Am St., note to your right the shuttered London Hotel, which was built in 1891 as a private residence by the Gordon family. At the turn of the last century, its rear farmyard housed Israel’s first ostrich farm. The building across the street at 17 Achad Ha-Am St. is regarded as Israel’s first hebrew school. 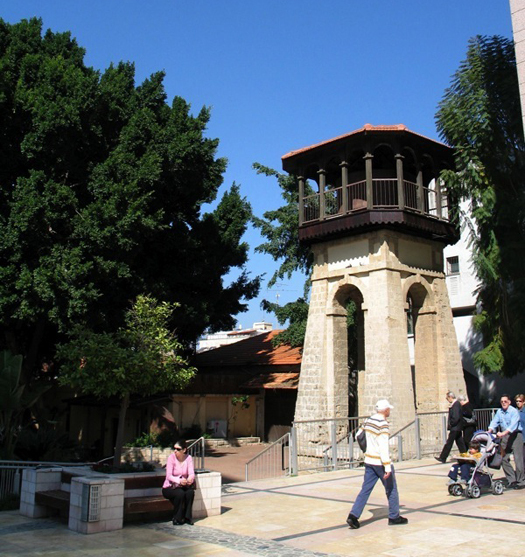 Start your Israel tour of Rishon at the old village bell on Rothschild St., and then continue your walk down Pioneers’ Way toward the Heisman House. This two storied home, which is constructed of sandstone, is typical of the Eastern European style of building which was so familiar to Heisman and the other the early founders. It is also there that Imber, the author of the poem Hatikva, lived during his time in Rishon. The Heisman House has been recently renovated and today serves as a beautiful new venue for historical and artistic exhibitions. Back on the main street, be sure to stop at the old kiosk with its juice squeezer and other artifacts, and peer into the old barber shop. At number 7 Rothschild St., the Kanner House is unique for its “colonial style” design with a wide slopping shingled roof, support columns and iron grill work around the terrace. In the years before the establishment of the state, the Haganah used the home as a local headquarters and arms cache. Further down the street at the corner of Mohliver, the dilapidated white house served as the home and office of Rothschild’s chief administrator. Some of the Baron’s other administrators resided at 24 Rothschild St., which has served as Rishon’s City Hall since the 1920s. The beautifully restored Community Hall on Zadal St. was built in gratitude for the Baron’s assistance and generosity, and has been the central social and meeting place of the village ever since. It is also there that the country’s first orchestra took residence in 1895. Attending the Rishon Le-Zion symphony during your Israel tour would no doubt be a treat. As you enter the park, take note of the water tower and well, which merits a tour. Stay for the movie, but be careful as it ends if you don’t want to get wet! 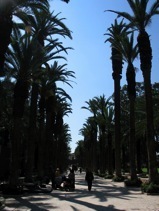 The majestic “Avenue of the Palms” in front of you has been the site of receptions for Theodore Herzl, Lord Balfour, Winston Churchill and other dignitaries. However, the area was originally a garden plot, an agricultural research station and then an orange grove, before evolving into the municipal park. As you stroll down the path toward the Carmel winery, note how well the recently built administration buildings, blend with the park and its surroundings. A number of new restaurants facing the park provide visitors with comfortable outdoor seating and excellent fare. On the other side of the park, the large brick buildings with their red shingled roofs and large dark cellars, were built by Baron de Rothschild in 1888, and soon evolved into one of the largest and most successful wineries in the world. In fact the winery became very self sufficient, housing its own barrel and pump workshop, a flour mill, a blacksmith, an ice factory and a distillery. If you have never had the opportunity to visit an older and larger winery, a tour of the premises would certainly be worthwhile. ( 03-948-8888). As you make your way down Ha-Carmel St. toward the corner of Achad Ha-Aham St., you won’t want to miss, what was built as Rishon’s most beautiful building, the Rothschild Administration Center. The complex of buildings and gardens, which also contains a memorial to Rishon’s fallen soldiers, has been painstakingly restored and is beautifully maintained. From there, it should be a short walk back to your car. Others have replicated the resourcefulness and sense of ingenuity demonstrated by the first settlers of Rishon Le-Zion before and after the establishment of the State of Israel. A case in point is the clandestine bullet manufacturing operation known as the Ayalon Institute that was established at Kibbutzim Hill in nearby Rehovot. This is certainly a must-see spot during your tour in Israel. During the mid 1940s self-sufficiency in the manufacture of weaponry and ammunition became an urgent matter for the leadership of the Jewish community in Palestine. Continuing conflict with the Arabs and the prospect of a British withdrawl from it’s Mandate in Palestine led to the local development of the sten sub-machine gun and the acquisition of surplus bullet manufacturing equipment in post war Europe. The equipment was smuggled into Palestine via Beirut with the assistance of a friendly British intelligence officer, but the question then became where manufacturing was to take place. The solution was found at Kibbutzim Hill, an established kibbutz near the entry to Rehovot, whose earthen mound would make an excellent hiding place for a clandestine bullet manufacturing operation. 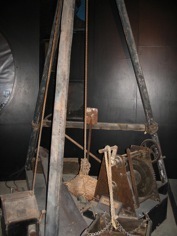 Within a span of 22 days a rectangular underground cellar was established into which the newly acquired machinery was placed. At one end a building containing washing machines to muffle the sound of the underground equipment was established, while at the other end a bakery was built, whose immense oven could pivot on the floor to permit access into the cellar. Recent immigrants to Palestine from Germany and Austria, as well as members of youth groups were recruited to work underground in secrecy, while others worked the fields of the kibbutz above. Copper for use in the manufacture of the casings was imported into Palestine under the ruse that it was to be used for the production of lipstick tubes. Thus, from 1946 to 1948 2.5 million bullets were manufactured at the Ayalon Institute, and at times as many as 40,000 bullets a day were smuggled out under the cover of darkness into the field of battle. David Ben Gurion has said that the efforts of these young members of the Haganah contributed greatly to the success of many military operations and the ultimate establishment of the State of Israel. Thereafter, many of these young people went on to found Kibbutz Ma’agan Michael on the shores of the Mediterranean near Zichron Yaakov. In 1987 the Ayalon institute was declared a National Historic site and the museum was opened to the public. Today you can only visit the Ayalon Institute by appointment (08-940-6552). 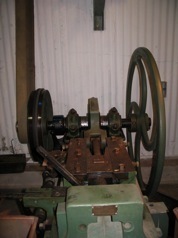 A tour guide will lead you to the underground manufacturing operations where photographs and written explanations describe the displayed equipment. The tour also includes a visit to the reconstructed bakery and laundry and an audiovisual presentation. 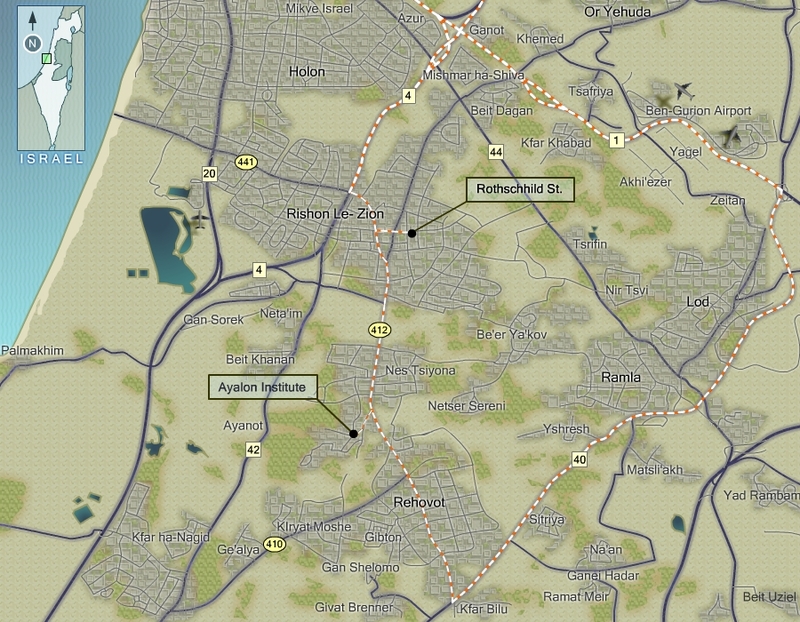 Directions to Rishon Le-Zion: Travel in Israel is relatively easy. 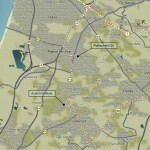 From Tel-Aviv or Jerusalem merge into Route 4 from Route 1 and exit at the sign directing you to Rishon Le-Zion center. Travel east over the viaduct following Jabotinsky St. until you reach light number 72. Turn left into Rothschild St., right into Herzl St., and left into HaCarmel St. After several blocks turn left into Nordau St. and then right into Rothschild St. once again, where you can look for street parking. Walk up the hill toward the synagogue. Directions to the Ayalon Institute: Return to Herzl St. and travel 8 kilometers until the street name changes to to Weitzman St. in the village of Nes Tziona.Soon thereafter, at the group of large white buildings known as Science Park, turn left into Hamada St. Proceed several blocks toward Chaim Holzman St. and turn left up the hill. At the conclusion of your visit, return to Weitzman St., which is now known as Herzl St. and proceed south to Route 40, where you will turn left in the direction of Ramle and Route 1.